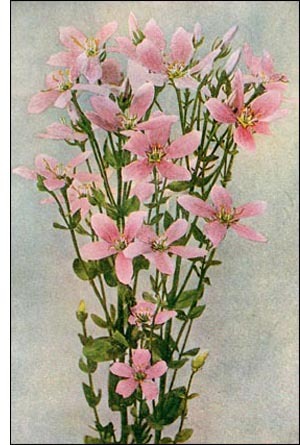 The Sea or Marsh Pink, or the Rose of Plymouth, as it is frequently called, is a member of the beautiful gentian family. The genus Sabbatia, a name adopted in honor of an Italian botanist, includes about fourteen species, all natives of eastern North America and Mexico. Our illustration is taken from Nature's Garden, and Neltje Blanchan, its author, writes as follows regarding those species of the marsh pinks that are confined to the vicinity of the Atlantic Ocean: " Three exquisite members of the Sabbatia tribe keep close to the Atlantic Coast in salt meadows and marshes, along the borders of brackish rivers, and, very rarely, in the sand at the edges of freshwater ponds a little way inland. From Maine to Florida they range, and less frequently are met along the shores of the Gulf of Mexico so far as Louisiana. How bright and dainty they are ! Whole meadows are radiant with their blushing loveliness."